“I’m just not a morning person!” you say, the thought of waking up prior to 7 am already giving you a headache. But research has shown that people who embrace mornings are more likely to have career success than those who prefer evenings. In addition to career success, morning people are thinner, happier, and more likely to stick to their workout routines. Enough said... we’re already setting our alarms to give us an extra head start on our day tomorrow. 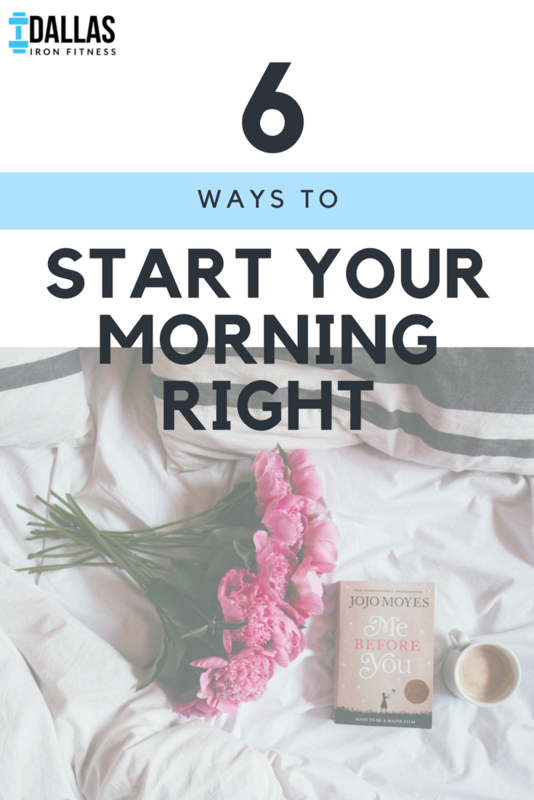 The key to embracing mornings is by creating a morning routine that you actually look forward to! Below are 6 ways to start your morning right. Use these suggestions to create a morning routine that’s just right for you! Your body just went 8+ hours (assuming you’re getting enough sleep, which you are, right?!) without any sort of fluid intake. If your cells could talk, they’d say, water please. Grab some lemon water and drink up before you reach for that cup of coffee. Set yourself up for success by setting a full water bottle by your bed before you head to sleep. That way when you wake up, you can immediately grab your water and get to sipping while you begin your morning! We like mixing in AdvoCare Spark to our water. AdvoCare Spark gives us the boost of energy we need to get through our day, and it comes in any flavor your heart may want: cherry, limeade, watermelon, pink grapefruit, you name it! Consider adding AdvoCare Spark to your morning hydration! Making your bed is a task that can be done in under a minute but which sets up your entire day for success. And yes, there’s research to back it up: making your bed makes you more productive! 3. Get in the sunlight. Your body’s circadian rhythm naturally responds to light. So soak in the sunshine in your morning: open the curtains while you get ready; step outside for a walk around the block; enjoy your breakfast or a book on the porch. The sun is meant to be a natural alarm clock—take advantage of it! Need we say more? “We KNOW breakfast is important!” you might be saying, with an added eye roll thrown in for extra effect. We get it: telling you to eat breakfast is perhaps the most cliche tip there is out there. So we won’t preach to the choir, and we’ll leave it at this: eat a good breakfast. Your body will thank you. Some research suggests that if you are looking to get active and improve your health, exercising in the morning is your best bet for setting yourself up for fitness success. Schedule in a morning workout class, hit the treadmill, or check out some of Dallas Iron Fitness’ online programs to start your morning with movement! If you’re local to the Dallas area, join us for our Saturday morning Dallas Sweat Club class! 6. Meditate. Visualize your goals. Pray. Journal. Read. How often do we simply allow ourselves to just be? In our always-on-the-go world, probably rarely (if ever) do we allow ourselves to just sit, unrushed. Why not build a few minutes into your morning that allows you to calibrate yourself for the busy day ahead? From personal experience alone, incorporating quiet and journaling time into our mornings has significantly changed the way we treat our days! There are so many science-backed benefits of meditation and quiet time: less stress, less anxiety, improved sleep, better emotional health, and more. Clearly, our bodies need time to slow down. So why not start your morning with your favorite cup of coffee and your cutest journal on your sunny deck? Who knows, you may actually begin to look forward to mornings! TELL US… How do you like to start your mornings? Leave a comment below! Did you know that Dallas Iron Fitness offers online fitness programming? That’s right—get fit on your own time. With FitBot, you’ll receive your daily workouts sent straight to your inbox, guided by your very own trainer. So start your mornings with Dallas Iron Fitness!